Rigoberto González, April 2009. Meet the Fierce Foursome – Maui, Trini, Isaac, and Liberace – the founding members of The Mariposa Club. To memorialize their final year in high school, the boys set out to create Caliente Valley High School’s first LGBT organization. Their hope is to create something that future students like themselves can belong to, and to let the four of them leave something important behind before they all go their separate ways. 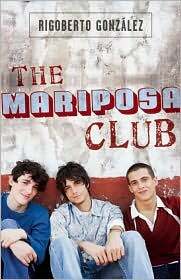 The first semester of their senior year is filled with hardship for the four gay boys, even as they try to get the Mariposa club started. In a small, relatively intolerant town, life isn’t easy for those who are different. The voice of the novel rings true through most of the narrative. The reader gets involved in the lives of these young boys and the secondary characters in their lives. It speaks well to both the isolation and camaraderie of this tiny group as the only boys who have come out in their high school. Some of the conflict seems cliché — perhaps even a little forced — but it serves to help the novel hit on many different problems this age group could face, especially as an LGBT teen. Recommended for high school readers and above. This entry was posted in 2009, gay male, gay-bashing, guest blogger, high school, latina/o, queer protagonist, realistic, Rigoberto Gonzalez. Bookmark the permalink.